Enjoy Vegas your way with spring savings. Save $75 on Las Vegas vacations. Book a flight + hotel package of $750 or more to Las Vegas, and save $75 when you use the promo code 75LAS at the time of booking. * Plus, save even more with additional hotel offers below. Offering world-class nightlife, award-winning restaurants backed by renowned celebrity chefs, and stylish rooms and suites, it is no wonder this resort is known as The Entertainment Authority. Hotel savings vary depending on date of travel. $100 food and beverage credit is available per stay. Hotel offer is valid in City Room, Terrace Studio, Terrace Studio Fountain View, Terrace One Bedroom, or Terrace One Bedroom Fountain View room categories. Hotel offer is valid in Deluxe Resort King/Double or Deluxe Panoramic View King/Double room categories. Center-strip with newly renovated rooms and suites. Toby Keith’s “I Love This Bar & Grill”, Ruth Chris Steak House, Fulton Street Foodhall. Carnaval Court with live music and some of the world’s top flair bartenders. The newly remodeled Tower rooms and suites offer stylishly functional accommodations for maximum comfort. Not combinable with other offers. The piazza at The Venetian Resort Las Vegas is the bustling epicenter and the beating heart of the resort. ALL NEW rooms and suites showcasing some of the best views in town. Gordon Ramsay Burger and award-winning Spice Market Buffet. Home to resident headliner Gwen Stefani show at Zappos Theater. From imported European marbles to towering fountains, exotic topiaries, and upscale, all-suite accommodations, this exciting Las Vegas hot spot caters to couples, honeymooners and luxury travelers alike. Enjoy over $150 in dining and entertainment savings including buy one, get one free admission to the Marvel Avengers S.T.A.T.I.O.N. exhibit. The hotel offers state-of-the-art gaming, access to the award-winning Mystère by Cirque du Soleil™, and a fantastic lineup of bars and nightclubs. Entertainment at Mirage Resort & Casino includes The Beatles LOVE by Cirque du Soleil™, Terry Fator - The Voice of Entertainment, The Mirage Volcano, and Siegfried & Roy's Secret Garden and Dolphin Habitat. Downtown Las Vegas hotel offering iconic Vegas ambiance, luxurious and modern rooms, a lagoon-style swimming pool, and a hip vintage feel you just won’t find on The Strip. Center-strip classic resort with newly remodeled rooms. BLT Steak and Sea Thai, as well as the famous Sterling Brunch. A relaxing pool oasis, a lavish spa and first-class Race & Sports Book. 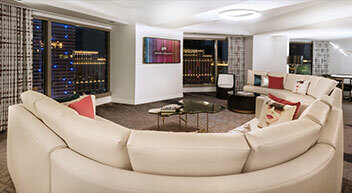 *$75 per reservation promotion code savings apply on flight + hotel vacation packages of $750 or more to Las Vegas. Savings is reflected in the package price when using promotion code 75LAS at the time of booking. Length of stay for flight and hotel components must match. Promotion code intended for redemption by individual consumer only. One-day advance purchase is required. Restrictions and exclusions may apply. Savings valid if booked 1/29/19 – 2/11/19 by 6:00 p.m. CT for travel 1/30/19 – 8/4/19. 1In order to redeem the full benefit of the food and beverage credit, guests must place a credit card on the room at check-in. All charges must be made to the room and credit will be applied at the time of checkout. Additional redemption details may be provided at hotel check-in upon request. 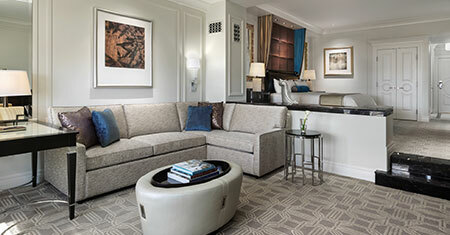 2To redeem the full benefit of the food and beverage credit, guests must place a credit card on the room at check-in. All charges must be made to the room and the food and beverage credit will be applied at the time of checkout. Resort credit is not valid at select outlets including Zuma, Beauty & Essex, and The Juice Standard. Not combinable with other offers or promotions. 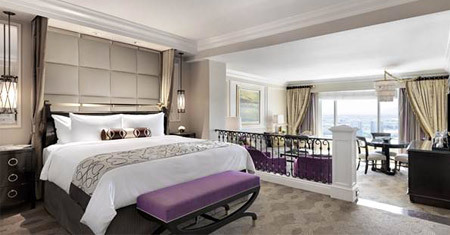 3Offer includes daily breakfast at The Buffet at Wynn Las Vegas for two people. Gratuities are not included. Any additional beverages or food items beyond the package allotment will be charged and taxed accordingly. Complimentary breakfast is available once daily per night stayed. 4Exclusive room savings are reflected in your package price. 5Added value offer includes savings such as drink and dining discounts at select locations, buy one, get one free admission to Marvel Avengers S.T.A.T.I.O.N. Exhibit, and free parking. Resort fees collected at hotel. Restrictions and exclusions apply. Reservations may also be required for some of the other offers. Look for redemptions details in your travel documents prior to departure. 6Guests will receive two vouchers per stay valid for one complimentary breakfast at The Buffet. Voucher must be presented to buffet cashier to be redeemed. Surcharge applies to weekend brunch and holiday meals at The Buffet. Gratuity not included. Limit one set of vouchers per room, per stay. No back to back reservations allowed. Offer valid for hotel guests only. Valid at Golden Nugget Las Vegas locations only. Management reserves all rights.